User-Defined Order in SQL — If your app has a type of item that can be arbitrarily reordered by users (e.g. a list of ‘to do’ items), this guide on ways to model that concept in SQL should prove interesting especially as it considers using fractions to do it. Breaking a Trillion-Rows-Per-Second with MemSQL — MemSQL is a proprietary, high performance real-time SQL database and a 9 server cluster with 448 total cores has managed to scan a trillion rows per second during queries. 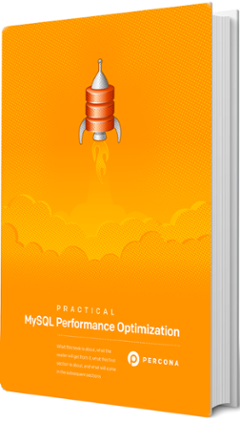 Learn MySQL Optimization From the Experts with Percona’s eBook Series — The content in this eBook will enable you to troubleshoot and optimize your own database performance. A Single-Node Hadoop 3 Install Guide — Want to explore Hadoop 3 without having a huge cluster to hand? You can do it on a single machine, as here. JSON Comes to CockroachDB — CockroachDB is an open source distributed SQL database and it has just introduced Postgres-like JSONB support. Why a Picture of Scarlett Johansson Got a Postgres Database to Start Mining Cryptocurrency — A payload was boiled into a photo which when stored and then accessed in a certain way led to a security issue. ▶ Redis' Creator on Writing System Software — The creator of Redis is producing a series of YouTube videos where he digs into implementation details of the popular data structure server. InfluxData Working on a Go(lang) Implementation of Apache Arrow — Arrow is a columnar in-memory data storage system and InfluxDB is keen to use it so have been working on a Go implementation - here’s why and how. Encouraging Minimal SQL Privileges — A call to encourage open source projects to only make users give apps the minimum privileges needed to operate. Dejavu: The 'Missing' Web UI for Elasticsearch — A 100% client-side rendered, modern Web UI for Elasticsearch. Azure Cosmos DB Query Cheat Sheets — Printable PDF cheat sheets that helps you use Azure Cosmos DB’s SQL, MongoDB, Graph, and Table APIs.